Rolex watches are symbols of prestige and refinement. 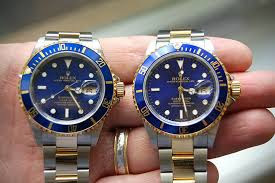 However, there is a thin line between a real Rolex watch and a fake one which is not always obvious, but with a few basic guidelines, it's usually possible to determine whether a Rolex is likely to be the real deal or a cheap imitation. For high-quality counterfeits, however, it may be necessary to consult a professional. That being said here are a few tips.